Yankee Candle - Family Fun, Free Entertainment, and Indoor Snow! Why has Yankee Candle become one of our "Kid's Pick" places for Williamsburg? It's a huge building housing a quaint little indoor "town." Looking a bit like Mayberry USA, it's designed to look like a series of shops around a town square. And it was rated as one of the "top Williamsburg Destinations by Disney Family Travel"! Candle-lovers: We really don't need to talk you into this, do we? Suffice to say, your only problem may be choosing from their huge selection. Keep in mind that they regularly offer buy-one-get-one 50% off deals, so before you buy, do look for coupons so you can get your candles for less. Look below for links to coupons. 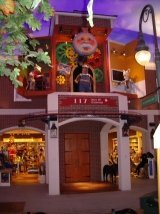 The attraction (and yes, this is one "shop" you can describe as an attraction) is a great place to stop by to enter the kids for awhile since they offer ongoing entertainment (and "snow" year-round), along with regular family-friendly events featuring for crafts for the kiddies and more. Their Christmas shop and activities are just one more reason why this is one place which many people put on their list for holiday fun. The clock show runs at the top of each hour. The Hickory, Dickory, Dock Show in the "town square"-- at the top of each hour the clock face "talks" and opens up to reveal animatronic mice performing a fun song. Tip #1: Bring your lunch with you, pull up one of the elegant, wrought-iron chairs in the courtyard, sit under the blue "sky" and enjoy the clock show for a totally fun and cheap experience you'll want to do again and again. Tip #2: Go to Yankee Candle.com for their latest coupons and in-store promotions. Or, go to Retailmenot.com to see what promotions they've found! Tip#3: For a cheap family activity, let your kids dip a candle in multi-colored wax to create a unique, fun gift that's perfect for giving for Christmas or birthday gifts.